This 890SBRX hard sided truck camper by Travel Lite has been designed to fit in the beds of most full-size 3/4 ton short bed trucks. These campers will hang over the back of an 6'6" truck bed by approximately 27". As you enter you will be pleasantly surprised by the space and amenities inside. 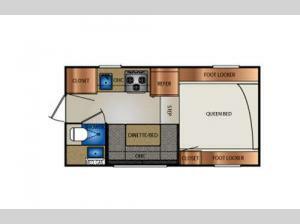 There is a wet bath on your right featuring a toilet, shower, and vanity with sink plus medicine cabinet. A storage closet for clothing and more can be found just inside the door to your left. The kitchen area provides a single sink with hi rise faucet, a three burner cook-top, and refrigerator. Opposite the kitchen area features a u-shaped dinette/bed combo with storage above the length of the seating. 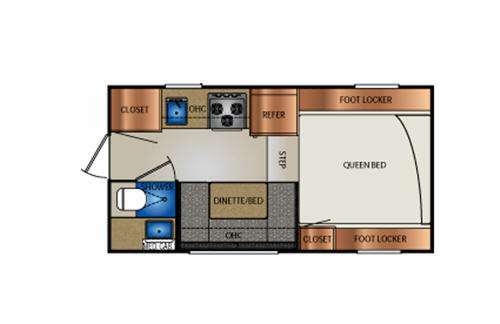 Head up the steps to the cabover queen size bed featuring foot lockers on either side of the bed including a rear right corner closet, plus so much more!